Dedicated: St Agatha’s Church, Clayfield sacristan Peter Bowden has served the parish for 30 years. The community celebrates its centenary this year. Photo: Emilie Ng. RUMOUR has it sacristan Peter Bowden lives in a cupboard somewhere inside St Agatha’s Church, Clayfield. At least, that’s the parish priest’s only explanation for the 74-year-old’s permanent presence in the church. An ever-present figure in the parish community, which turns 100 this year, Mr Bowden opens and closes the church every day, and attends all the week day and weekend Masses to the point where new parishioners mistake him as the boss. “I often get called, ‘Father’,” Mr Bowden said. “I know sometimes I’m here seven days a week but I don’t mind. 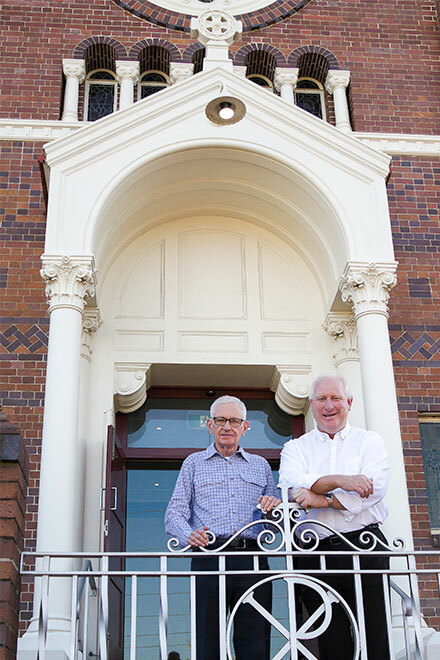 Originally from the neighbouring Nundah parish, Mr Bowden eventually moved to the Clayfield parish 30 years ago. “I sat in the back seat, minding my own business,” he said. “I didn’t know anybody. When he’s not serving the priests on the altar, Mr Bowden is doing his second-most important job – rallying volunteers to do the readings at Mass, distribute Communion, process down the aisle with the gifts, pass the tithing baskets, or work the church slides. “They never say no to me,” he said. All that dedication to one parish community isn’t for any saintly glory. “I’m not up there for the halo, a big seat up there or anything like that, not the Order of Australia, or Knighthood of St Gregory,” Mr Bowden said. Clayfield has welcomed six parish priests in the past 100 years, and they have typically served the community for a decade or more. They include Fr Francis O’Connell, Monsignor John English, Fr Vincent Rowan, Fr Bernard Wilson, Fr Adrian Farrelly and parish priest Fr Anthony Mellor. Mr Bowden has served at the altar and beyond for four of the parish’s pastors, plus a further eight associate pastors and scores of supply priests. He will take his place at the altar again when Archbishop Mark Coleridge visits the parish to celebrate its centenary Mass today (August 12). Mr Bowden said his mum, who died in 2001, and his father, who died in 2008, were the reason why he was still serving the Church today. “My mother believed in the faith, and she always said to me – and my father said the same thing – they said, ‘Peter, do not lose your faith when we go, you’ll see us again’,” he said. “My mother and father said, ‘Please keep up your dedication to St Agatha’s Church’. 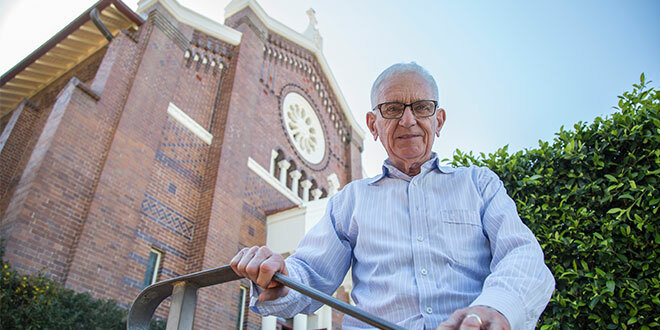 Fr Mellor, who is Clayfield’s sixth parish priest, said as a busy pastor, his trusty sacristan kept the community “on track”. Faithful servants: Peter Bowden with Clayfield parish priest Fr Anthony Mellor, who has served the community for three years. Mr Bowden and Fr Mellor work together to maintain the running of the church. Photo: Emilie Ng. “I think most of the time I feel I’m Peter’s assistant rather than the other way around,” he said. Fr Mellor has been busy leading the community in a year of gratefulness to commemorate 100 years of faith in Clayfield. Originally part of the Wooloowin parish, Archbishop James Duhig paid £1315 in 1917 to buy the steep, sloping land on Oriel Rd, Clayfield. Archbishop Duhig placed and blessed the foundation stone for the new church on August 11, 1918, and, by September 20, the community received a small timber church. Within seven years, the wooden church was converted into a school and a new church built in front of it – a large brick beauty that cost £10,000 to build. It was blessed and opened on April 10, 1925. Fr Mellor said 100 years on, 2018 had been a year of gratitude and looking forward to the future. “In the Church, having gone through difficult times, it’s good to have things to celebrate and turn hearts to gratefulness,” he said. As for what Fr Mellor is grateful about, it’s that he’s never had to dress up as a donkey on Christmas Eve in his three years as pastor. “The thing that has intrigued me here is the Christmas donkey, Dizzy, seems to have a life of her own,” he said. “Without the donkey at Christmas we’d only get half the people.